We are noticing more and more gannet eggs on the Bass as the parents begin to get a little restless on the nests. Hopefully a sign that their chicks are on their way! We do have the cormorant chicks that can be seen via the Craigleith North camera and they are growing very quickly. There has also been a few female eiders spotted on Craigleith taking their ducklings down to the water to form a creche. There are a lot of other eggs to be seen on camera at the moment with guillemot, razorbill and shag eggs all relatively visible (despite the fog!) on their respective nests. The gulls seem to have taken hold of some areas on Fidra and Craigleith with nests popping up all around our cameras. 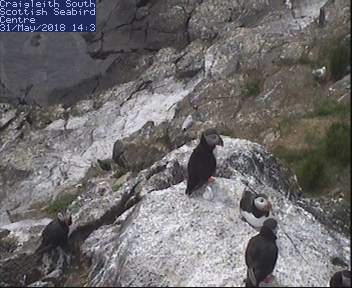 Puffins are becoming more settled on the islands at the moment and are staying visible throughout the day compared to how they were behaving a few weeks ago. We have also seen quite a lot of activity on the burrow camera with two puffins coming and going. We hope that this year we will see more of the egg/ puffling with a slightly altered view of the burrow this year, fingers crossed. The first sighting of dolphins occurred last Friday from the scope deck and hopefully we have as good a year as last year in terms of sightings! To keep up-to-date with the webcam action, click HERE.